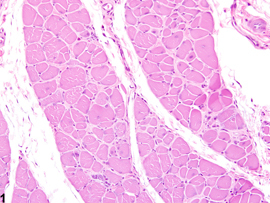 Skeletal muscle - Fibrosis in a male Harlan Sprague-Dawley rat from a subchronic study. Early change consists of increased perimysial deposits of pale eosinophilic material (immature collagen). 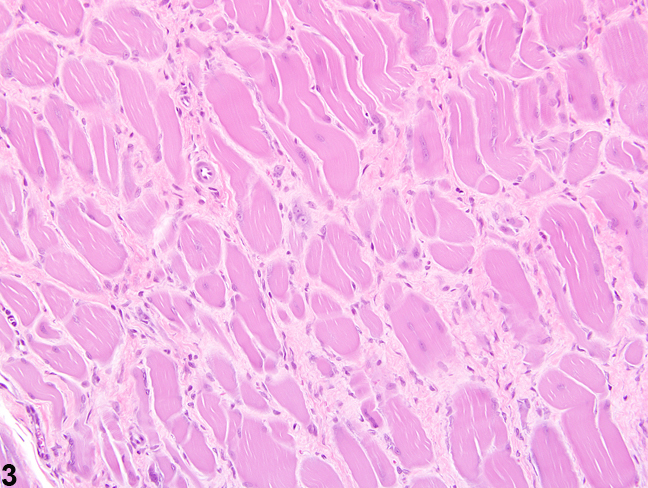 Skeletal muscle - Fibrosis in a male Harlan Sprague-Dawley rat from a subchronic study. Note the perimysial proliferation of fibroblasts and early collagen deposition. 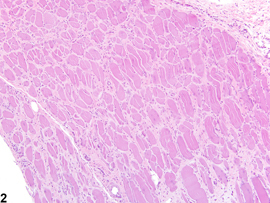 Skeletal muscle - Fibrosis in a male Harlan Sprague-Dawley rat from a subchronic study (higher magnification of Figure 2). 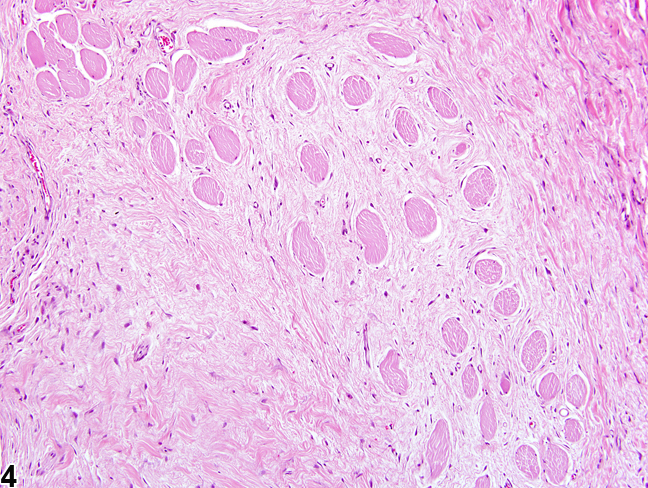 There is deposition of perimysial connective tissue and attenuation of several muscle fibers. 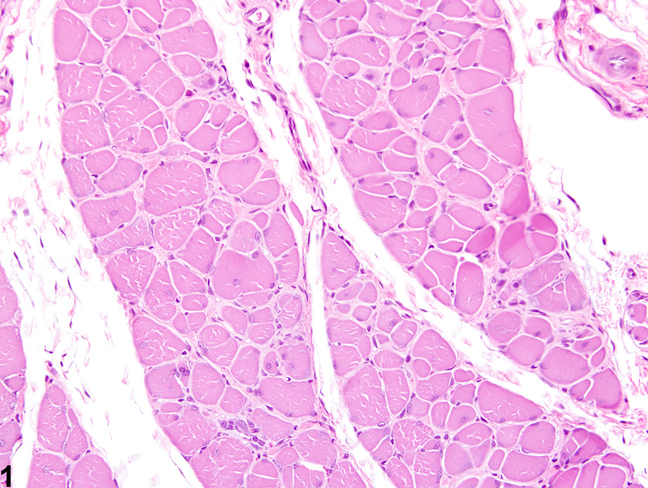 Skeletal muscle - Fibrosis in a male F344/N rat from a chronic study. 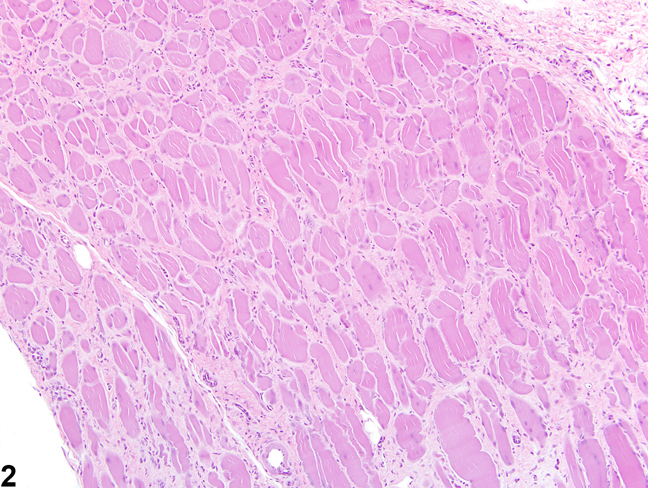 There is marked fibrosis with attenuation and loss of muscle bundles. 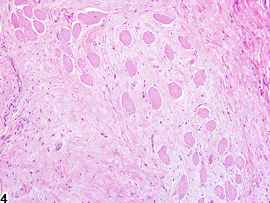 In skeletal muscle, the predominant histologic features of fibrosis are increased numbers of plump reactive fibroblasts with prominent vesiculated nuclei, and increased amounts of pale eosinophilic fibrillar material (collagen deposition) separating and surrounding adjacent myofibers ( Figure 1 , Figure 2 , Figure 3 , and Figure 4 ). 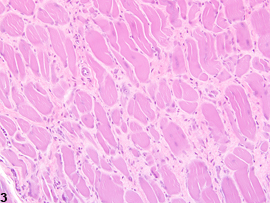 Affected myofibers may or may not exhibit histologic features of atrophy, degeneration, necrosis, or regeneration. Fibrosis is the end result of a cascade of events that begins with tissue injury and inflammation and ends in permanent scar formation. When tissue is damaged, profibrotic cytokines, such as transforming growth factor beta, are released by the infiltrating inflammatory cells. These cytokines signal the fibroblasts to migrate into the affected region and to begin producing and remodeling the extracellular matrix. The stromal fibroblasts then begin producing cytokines, growth factors, and proteases that further trigger and uphold the inflammatory/profibrotic conditions. While fibroblasts are fundamental for maintaining tissue homeostasis and regulating normal wound repair, they also serve as a crucial intermediate in the formation of chronic fibrotic diseases. During conditions of chronic or extensive muscle damage, persistent inflammation, prolonged fibroblastic activation, and attenuated reparative capacity of the satellite cells ultimately lead to excessive accumulation of extracellular matrix components. This inhibits myogenic repair and leads to the replacement of muscle with fibrotic/scar tissue. While nutritional, exertional, and toxic myopathies can result in extensive regions of muscle damage, repair is often extremely effective, and thus fibrosis is minimal to absent. In contrast, the reparative process is often ineffective following damage due to ischemia, likely due to the subsequent death of the satellite cells and endomysial cells. For this reason, extensive regions of fibrosis are often a dominant feature. When present as a primary change, fibrosis should be diagnosed and graded. Fibrosis that is present as a minor component of chronic or chronic-active inflammation should be diagnosed only if it is a prominent component of that lesion or if the degree of fibrosis is not commensurate to that of the inflammation (i.e., the fibrosis is more severe than would be expected given the severity of the inflammation). If fibrosis is not diagnosed separately, it should be described in the pathology narrative. Whenever it is diagnosed, fibrosis should be graded based upon the overall involvement of the tissue and the degree to which the underlying architecture is obscured. Since fibrosis is often the end result of an initial inflammatory process, potential causes of the fibrosis should be discussed in the pathology narrative. Additional myopathic changes (e.g., inflammation, necrosis, regeneration) should not be recorded separately unless warranted by severity. Berridge BR, Van Vleet JF, Herman E. 2013. Cardiac, vascular, and skeletal muscle systems. In: Haschek and Rousseaux’s Handbook of Toxicologic Pathology, 3rd ed (Haschek WM, Rousseaux CG, Wallig MA, Bolon B, Ochoa R, Mahler MW, eds). Elsevier, Amsterdam, 1635-1665. Greaves P, Chouinard L, Ernst H, Mecklenburg L, Pruimboom-Brees IM, Rinke M, Rittinghausen S, Thibault S, von Erichsen J, Yoshida T. 2013. Proliferative and non-proliferative lesions of the rat and mouse soft tissue, skeletal muscle, and mesothelium. J Toxicol Pathol 26(3 suppl):1S-26S. Haschek WM, Rousseaux CG, Wallig MA. 2010. Cardiovascular and skeletal muscle systems. In: Fundamentals of Toxicologic Pathology, 2nd ed. Academic Press, San Diego, 319-376. Leininger JR. 1999. Skeletal muscle. In: Pathology of the Mouse (Maronpot R, Boorman G, Gaul BW, eds). Cache River Press, St Louis, 637-643. Mann CJ, Perdiguero E, Kharraz Y, Aguilar S, Pessina P, Serrano AL, Muñoz-Cánoves P. 2001. Aberrant repair and fibrosis development in skeletal muscle. Skelet Muscle 1:21. McDonald MM, Hamilton BF. 1990. Bones, joints, and synovia. In: Pathology of the Fischer Rat: Reference and Atlas (Boorman G, Eustis SL, Elwell MR, Montgomery CA, MacKenzie WF, eds). Academic Press, San Diego, 193-207. Vahle JL, Leininger JR, Long PH, Hall DG, Ernst H. 2013. Bone, muscle, and tooth. In: Toxicologic Pathology: Nonclinical Safety Assessment (Sahota PS, Popp JA, Hardisty JF, Gopinath C, eds). CRC Press, Boca Raton, FL, 561-587. Van Vleet JF, Valentine BA. 2007. Muscle and tendon. In: Jubb, Kennedy, and Palmer’s Pathology of Domestic Animals, 5th ed, Vol 1 (Grant MG, ed). Elsevier, Edinburgh, 185-280.